The Naini Lake, sitting in the lap of mountains in Nainital, Uttarakhand, is visibly struggling. The water level of the lake has dropped drastically, exposing the lake bed in many areas. “An indication of the lake’s health can be gauged by the fact that while it reached zero level only twice before 2000 (1923 and 1980), since 2000 the zero level has been reached 15 times,” says Vishal Singh, research coordinator, Centre for Ecology Development and Research (CEDAR). Along with the University of Cambridge, CEDAR, studied the lake from 2014 to 2016. “Usually, the zero level is reached in May-June, however, this year, the lake dropped to zero level in January itself,” Singh adds. In March this year, the water level reached a new record low at 13.2 feet below the zero level. 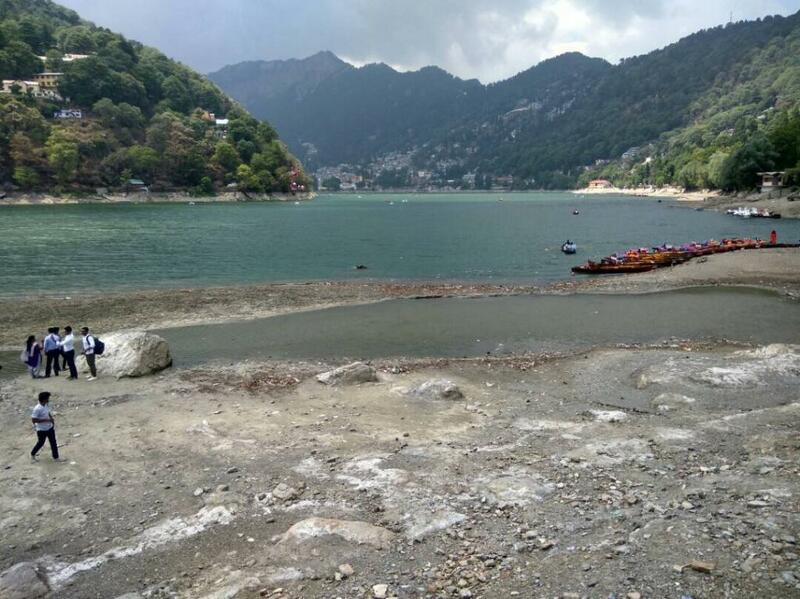 There are two reasons that the experts believe are making the lake shrink: obstruction in the subsurface recharge and increased abstraction of water to quench Nainital’s thirst. In 1995, a research by the National Institute of Hydrology (NIH), Roorkee showed that the main recharge zone of the Naini lake is Sukhatal, a seasonal lake situated 50 metres above Naini lake. Covering an area of two hectares, the Sukhatal lake absorbs water during the monsoons and then this water recharges the Naini lake during the dry seasons. In fact, another study carried out jointly by NIH and the Indian Institute of Technology, Roorkee in 2008 found that 53 per cent of Nainital lake’s water recharge happens through the water absorbed by Sukhatal. 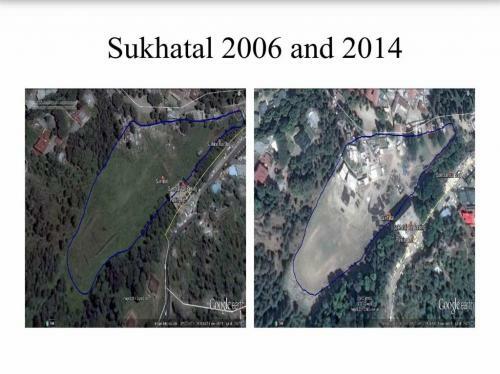 However, Sukhatal recharge zone of the Nainital lake has fallen prey to encroachment. The CEDAR study observes that once residential area mushroomed over the lake bed, pumps were installed “to ensure that houses in and around Sukhatal were not flooded during the monsoon, ironically making it a “sukha-taal” or a ‘dry-lake’.” This has severely reduced the recharge capacity of Sukhatal lake which has directly manifested itself in the form of decreasing level of the Naini lake. Rawat filed another PIL in 2012, asking the Uttarakhand High Court to look into the matter of encroachment in Sukhatal and the natural drains recharging the Naini lake. It also urged the court to declare the lake area an eco-sensitive zone. The court had ordered the National Environmental Engineering Research Institute (NEERI) to submit a report on why water level in the lake is receding. Last year, hearing Rawat’s PIL, the Uttarakhand High Court directed the Irrigation Department of Uttarakhand to rejuvenate the Sukhatal lake. Singh says that the Detailed Project Report (DPR) prepared by the irrigation department is lopsided. “They are saying that they will create an artificial lake in the Sukhatal lake region. But this will seal the lake bed and destroy its recharge capacity,” he says. Moreover, Singh also fears that the lake, with its storage capacity of 8.8*104 m3, might actually be a disaster waiting to unleash itself on the region. “A fault line runs near the Sukhatal lake and divides Nainital into two. This is a seismically active zone and any tectonic movement will wash away the entire settlement,” he explains. The other factor eating up, or rather drinking up the Naini lake is the increasing amount of water abstraction from the lake to meet Nainital’s water demand. According to the Uttarakhand Jal Sansthan (UJS) data, a major portion of the Nainital’s water demand is met by the Naini lake and it is supplemented by water from Sukhatal lake and natural springs. “Currently, on an average, 14 million litres per day (MLD) of water is taken from the Naini lake, 2 MLD from the Sukhatal lake and around .5 MLD comes from the natural springs,” Singh quotes UJS data. In early 19th century, Nainital got a very basic sewerage system—perhaps its first. But rapid urbanisation soon proved this set-up to be inadequate, leading to overflow from storm water drains and ultimately causing sewage discharge into the Naini Lake. “Labourers hired for housing construction activities, and hailing from Nepal, eastern Uttar Pradesh and Bihar, defecate in the open on the shores of the lake,” says Rawat. Due to this, a lot of ‘illegal’ sewage also flows into the Naini. According to the District Urban Development Agency (DUDA) and Nagar Palika Parishad (NPP), Nainital has 10 main slums scattered across the town, accounting for about 21 per cent of the total population. Many of these slums lie within the catchment area of the lake. Moreover, Nainital does not have sewage treatment facilities. It has to expand its sewer network, and provide decentralised sewage treatment plants (STPs) and on-site treatment in low density areas. Deforestation, too, contributes to the problem. “Though tree felling is banned above 1,000 metres in the Himalayan region and Nainital is more than 1,938 metres above sea, the Forest Department itself cut 246 green trees, mostly oak, in the G B Pant High Altitude Zoo, Nainital, on the pretext that the animals are feeling cold,” Rawat told Down to Earth. 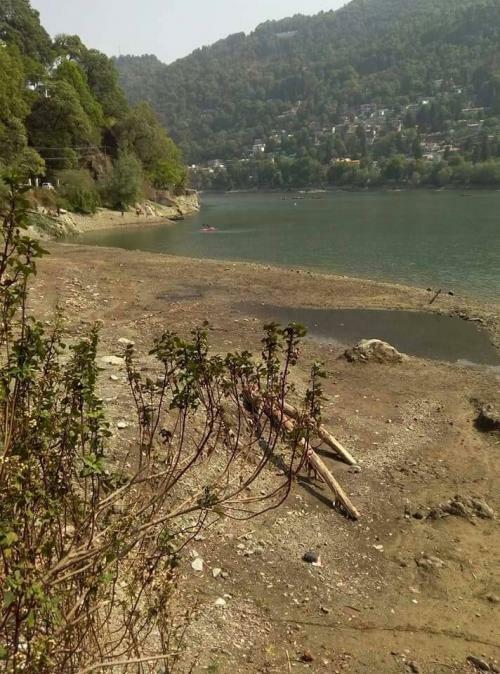 While it is clear that the fate of the Naini lake hangs in the balance, the locals have now started organising campaigns to save their water body. A change.org petition started earlier this year is culminating into a “silent and barefoot protest” on June 3. Protestors will march barefoot from one end of Nainital (Talli tal) to the other (Malli tal). “Thousands of years back, people used to enter the lake barefoot, it was that revered. We are trying to bring back the same reverence by marching barefoot,” one of the organizers said. 1993: Ajay Singh Rawat files writ petition in the Supreme Court seeking its intervention to prevent further pollution of the Naini Lake. 1995: Court calls for a report from an advocate to be appointed by the district judge. The report discloses that the Naini Lake had turned dark green with an oily surface and was heavily polluted with all kinds of waste. Unauthorised constructions on its banks— even by the Kumaon Mandal Vikas Nigam and the Lake Development Authority—were rampant. The court directs that sewage water and horse dung be prevented from entering the lake, and construction of multi-storied group housing and commercial complexes in the town area be banned. It recommends setting up of a monitoring committee for taking concrete steps. 2002: Roorkee-based National institute of Hydrology initiates a Rs 50-crore restoration programme sponsored by the Ministry of Environment, Forest and Climate Change (MoEFCC). The conservation and management plan conceived by the NIH is not only lake-centric but also focuses on the immediate periphery of the lake. 2006: Rawat files another petition seeking a ban on building in eco-fragile areas—the catchment area of the lake. 2008: A bio-manipulation project is implemented in the lake. Under it, 35,000 mahaseer fish are released into the lake. May 2008: The Nainital administration launches a drive to remove illegal constructions in the sensitive areas of the lake. About 43 buildings are identified. The move is in compliance with a Supreme Court order passed on a petition filed by Rawat, complaining about illegal multi-storied buildings around the lake that have come up in direct contravention to the 1995 order by the court. December 2008: Residents switch over to a scientifically designed garbage disposal system. Under a project named ‘Mission Butterfly’, sweepers collect waste from each household and directly transfer it to compost pits, where it is converted to manure. “This lake is connected to 62 drains, out of which 23 fall directly into it; the whole lake is polluted because of unscientific garbage disposal,” says Nainital Lake Conservation Project engineer S M Shah. March 2009: The Supreme Court bench headed by Chief Justice K G Balakrishnan asks Rawat to approach the Uttarakhand High Court to stop illegal constructions and felling of trees. Rawat’s petition had deposed that multi-storeyed group housing societies and commercial complexes were coming up in the town with official connivance. Trees were also being cut in utter violation of the SC order and the Forest (Conservation) Act, 1980. The Court gives the order that “multi-storeyed group housing and commercial complexes have to be banned in the town area of Nainital. Building of small residential houses on flat areas could, however, be permitted”. The court also asks the state to make illegal felling of trees a cognisable offence and restrict vehicular traffic on the Mall. August 2009: The civic authorities launch a fresh demolition drive of illegal buildings which were posing a threat to the lake. Several civil groups also launch a cleanliness drive for the lake. 2012: Rawat filed another PIL against indiscriminate and illegal construction activities in the green zones as demarcated by the Lake Development Authority, Nainital and other prohibited areas of Nainital. The PIL put forward the need to declare Nainital area an 'Eco-Sensitive Zone' and preservation of recharge zones of Nainital Lake. 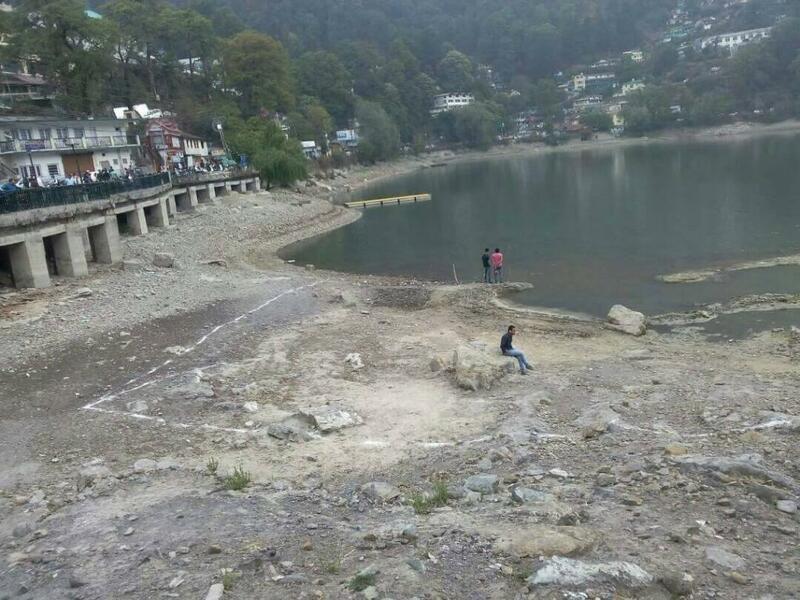 Lack of adequate rainfall and snowfall in the Nainital area along with the mismanagement of the catchment area has affected the water level of the Naini Lake—the only natural source of water in the town. “The lake has reported an alarming rate of decrease of water level in the recent decade,” says Rohitash Sharma, executive officer of the Municipality of Nainital. Last year, the level of water in the lake broke 25-year record and had become a cause for concern for the authorities and others involved in varied commercial activities based on this lake and tourism. “It almost reached seven feet below the zero mark during the end of May last year,” says Chandra Singh Negi, Executive Engineer of Public Works Division (PWD), Nainital. While Sharma says that this year too, the water level is a matter of grave concern, Negi argues that the level is still 6.85 feet below the zero mark and is better than the last year. In the monsoon, the water level reaches 12 feet above the zero mark, which delineates the normal water level, claim newspaper reports. The PWD is in charge of maintenance and the officials don’t agree that they had failed to maintain the lake in all respect. The growing concern about the health of the lake forced Uttarakhand Chief Minister Trivendra Singh Rawat to shift the maintenance responsibility from PWD to the irrigation department this week. Rawat directed the irrigation department to prepare a holistic plan for the revival of the lake. This will increase the water level of the lake and also improve its storage capacity, says Ajay Singh Rawat who is actively involved in the revival of the health of the lakes in and around Nainital. He had filed a couple of petitions to save these lakes. “The citizens are now happy that the irrigation department is in charge of restoring the lakes. The irrigation department has experience in water management and can surely bring back life to the lake by working on the catchments, feeder channels (to the lake),” adds Ajay Singh Rawat. PWD has experience only in making roads and flyovers and had failed to maintain the lake in all these years, he opines. Sharma says that the maintenance work has been shifted to the irrigation department as they have fund for the revival and restoration for water bodies. The PWD was facing problems in diverting their funds towards water management of the lake as the funds available with them are only for building and maintenance of roads or concrete structures. The municipality, which is the owner of the lake, feeder channels and the catchments, did very little to conserve the lake. While the municipality blamed the PWD for the poor state of the lake, PWD blamed that the municipality is not maintaining the feeder channels and catchment area. Ajay Singh Rawat explains that the channels carrying runoff are encroached illegally and the catchments are dotted all over by the buildings, cutting down the runoff. In this blame game, another angle has emerged: the Nainital Lake Region Special Area Development Authority or the Lake Development Authority (LDA) as it is popularly known. “In 2003, around Rs 47.96 crore had been approved for the catchment treatment and improvement of the quality of the lake under the Nation Lake Conservation Plan (NLCP),” says Chandra Mohan Sah, project engineer, LDA. The Ministry of Environment, Forest and Climate Change (MoEFCC), under U.P. Special Area Development Act, 1986, notified the LDA to implement the restoration works under the NLCP. “We are now no way connected to the conservation of the lake,” says Sah. Around Rs 31 crore have been released till January 2017 under the NLCP. In spite of the restoration work, there had been high siltation in the lake which decreased its depth—the lake’s depth has reduced from 29 m in 1871 to only 17 m, according to recent newspaper reports. Sah opines that the decrease in depth is only because of less rainfall received. Sah goes on to explains that the LDA’s role is now restricted to giving permission to constructions that can take place in and around the lake, which is obviously part of the catchment. According to him, the LDA ensures that construction takes place only in areas where runoff to the lake is not stopped. This is why it works very closely with the Geological Survey of India (GSI). Ajay Singh Rawat differs on this. According to him, LDA had written to the state government in 2006 that the carrying capacity of Nainital was over, but still they continue to give permission to constructions. He adds that since the registration of the commercial buildings and Group Housing was banned in response to his PIL of 1993 in Supreme Court, people continue to register as individual residence and convert them into guest houses. The lake is under threat as its ownership is not very clearly defined. One department owns the lake and another maintains it. A water body may die if there is a conflict of interest among these two agencies. This situation again demands a creation of an umbrella authority for the conservation and protection of the urban lakes (along with their catchments and feeder channels) that will have legal teeth. The existing Wetland Conservation and Management, Amendment Rules, 2016 has, in no way, helped in protecting the lake. The PIL filed by Ajay Singh Rawat for saving the catchment and feeder drain of the Naini Lake has been in the High Court for nearly five years now. Often, cases with long waiting period have killed the lakes. Take the example of Badkhal Lake in Haryana. It had dried up but the case to protect it was pending for 15 years due to the absence of wetlands law. We need a strong law to protect the urban lakes at war footing, say the green lawyers.